Nouakchott (Arabic: نواكشوط‎) is the capital and largest city of Mauritania. The city has a population of roughly 1 million people and is located in the west of the country, along the Atlantic coastline. The city is the administrative and economic centre of Mauritania and is actually one of the biggest cities in the Sahara, as the desert ends right in the ocean here. The city is spread out and few high buildings can be found here. Although compared to many other place in the country it has good facilities for travellers, it is not really an attractive city to spend several days. 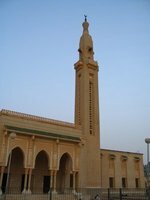 Nouakchott is, despite its location near the sea, a hot and dry place with temperatures usually between 30 °C and 35 °C during the day and well above 20 °C at night. January is the coldest month, but still temperatures average between 16 °C at night and 28 °C during the day. October is the hottest month and temperatures of 45 °C are not uncommon when the wind blows straight from the desert. August and September have the highest rainfall but it usually is not more than around 40 mm or so. Other months are almost as dry as they could be with 1 or 2 days having a rainshower. Nouakchott International Airport (NKC) receives a number of international flights, including those with the national airlineMauritania Airways. International flights include those to and from Abidjan, Algiers, Bamako, Brazzaville, Casablanca, Cotonou, Dakar, Las Palmas and Paris. All these destinations and Tunis are served by other airlines as well, mainly the national ones like Air Algérie and Air France. From/to Nouadhibou (470 kilometres, about 6 hours): the most comfortable option, a Mercedes taking 4 passengers, costs from 4,000 ougiya. Sept-places are also available. It is also possible to arrange direct transport from Dakhla in Western Sahara. Ask in Hotel Sahara. The duration of the trip depends mostly on border formalities. From/to Rosso: cars to Rosso (border with Senegal) depart from Garage Rosso south of town (taxi from the centre - about 500 oug). The journey takes approximately 3 hours and costs about 3,000 oug in a Mercedes. Taxis around town cost up to 200 oug, to the fishing port west of town (Port de Peche) - 300 oug. There is a decent variety of restaurants in Nouakchott with plates from 1,000 to 3,500 UM. Most restaurants in the capital offer pretty much the same menu - simple pizzas, hamburgers, sandwiches, and salads. Nicer places, such as Plan B, New Rest or Iman, will have steaks, brochettes, seafood and even curry! Mauritania is a dry country, but alcohol can still be found if you know where to look! Many of the French- and Spanish-owned clubs and restaurants will have some whiskey or beer available, depending on their supply, and will run from 2,000-3,000 oug a drink. If you're checking in the United States embassy, ask the Marines on duty (please be subtle about it) if they're having a party. You'll have a great time in a safe place. Same can be said at just about every embassy, as the expat community is very close and will spend the weekends together. We have a comprehensive list of accommodation in Nouakchott searchable right here on Travellerspoint. You can use our map to quickly compare budget, mid-range or top of the range accommodation in Nouakchott and areas nearby. This is version 8. Last edited at 3:17 on Aug 2, 17 by sleepBot. 6 articles link to this page.